DESCRIPTION: The outer sleeve houses the front or distal element (a doublet)and slides in two grooves through which two screws with knurled knobs fit. The screws can be used to fix the position of the outer sleeve. The inner barrel contains the back elements (two doublets). There are two horizontal lines on the inner barrel, one shorter than the other, and both visible through a cutout in the outer sleeve which has a line to register against the lines on the inner barrel to indicate position; these features are best seen in the image to the right, an enlargement of the one on the left. These images are of an example from another private collection. Although unlabeled, these lines serve as rough guide as to how to adjust the collar for slides which have a cover slip ('covered') or one without ('uncovered'). The elements would be set further apart for uncovered specimens, closer for covered. Furthermore, the spacing would change slightly for different thicknesses of cover glass; the thicker the glass, the closer the elements need to be to provide the best image. Obviously this push-pull adjustment is quite tedious to set just right, which accounts for the improvements made soon after this type was invented, as noted below in the history section of this web page. 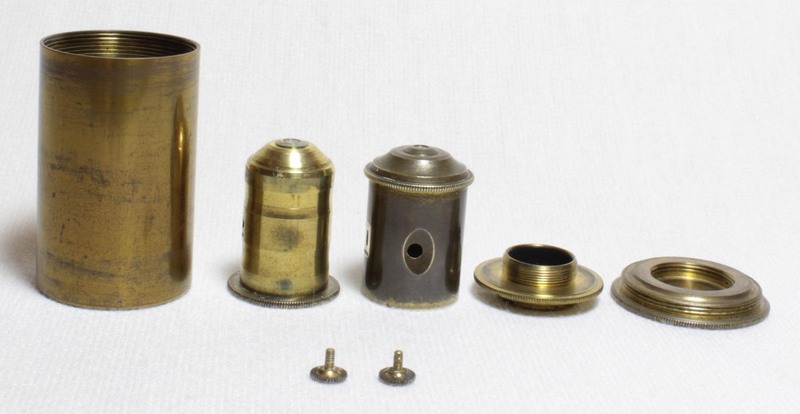 This objective measures 16.5 mm in outside diameter in the middle of the outer barrel. It has a thread adapter at its end which changes the female thread to a male thread of slighly larger diameter. The diameter of the threads which fit into the objective have a an outer diameter of half an inch or a little less than 21 mm and a pitch of about 56 tpi. 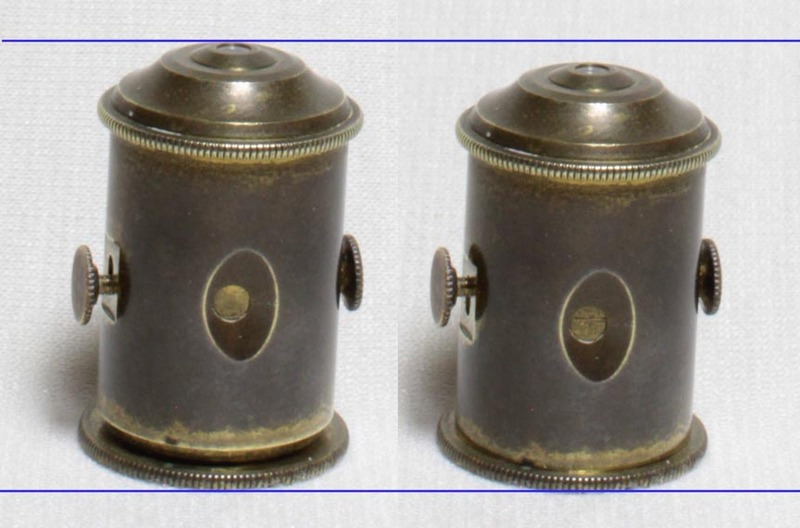 The wider side of the adapter has threads which would fit the nosepiece of the microscope. These threads are 9/16 inches or about 14 mm in diameter with a pitch of about 36 tpi. 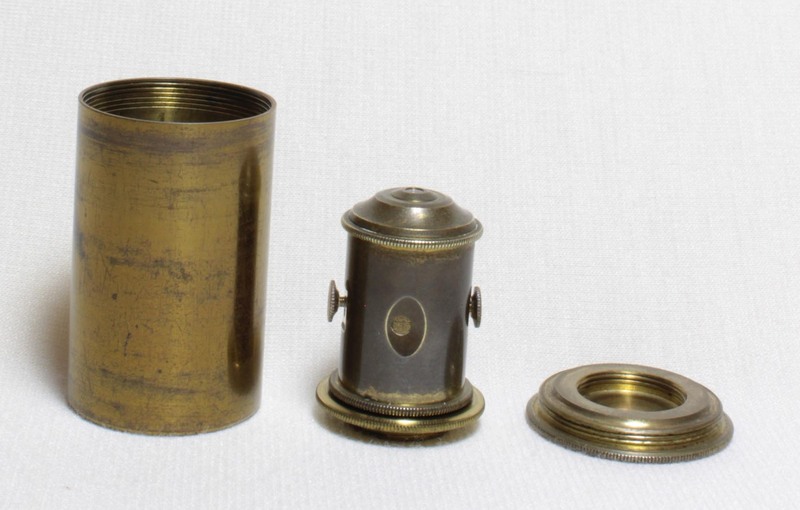 The threads that would fit the nosepiece also fit the inside of the top of the can. With the adapter in place, the maximal length, with the outer elements at a maximal distance from the inner ones is 33 mm. Minimal length is about 31.5 mm, without the adpter 27 mm. The correction collar is an adjustment device on some moderate to high power objectives to compensate for variations in the thickness of cover slips. As the work of Joseph Jackson Lister resulted in improvements in the optics of the microscope, which substantially reduced chromatic and spherical aberration, it became clear that when a coverslip (cover glass) was introduced in the optical path between the objective and the specimen, spherical, and to a lesser degree, chromatic aberration, were again introduced into the system. To correct this requires changing the distance between the front and back elements of the objective. Another way to partly correct this is by changing the tube length during the observation. Although one could construct the objective specifically for a certain thickness of coverslip, such standardized coverslips were not available, and even today the stated thickness of most coverslips is only approximate. 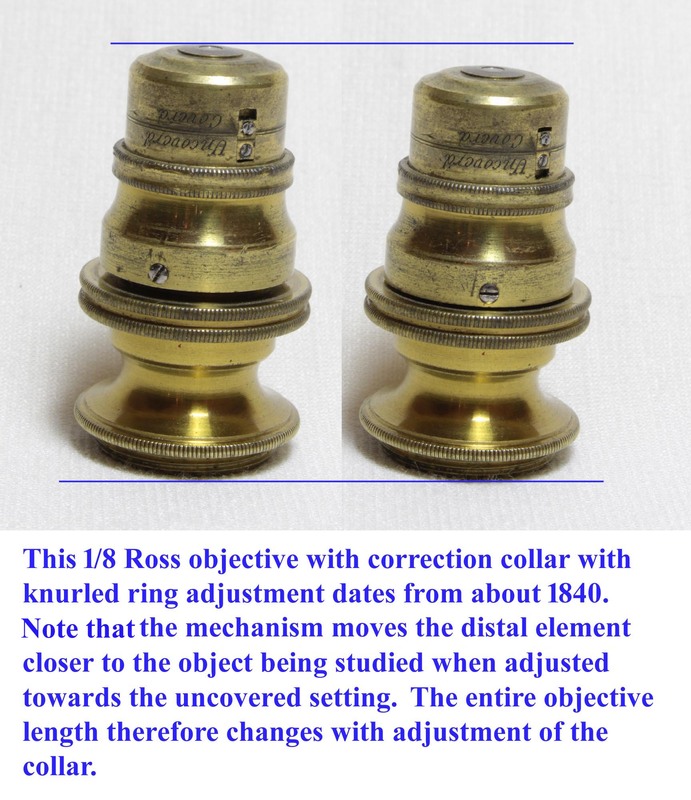 The idea of a correction collar dates back to work by Lister and Ross. Once Lister had developed the theory of how to correct spherical and chromatic aberrations in the 1820's, he realized that the distance between the front element and the back elements of the objective would need to be different depending on the thickness of the coverslip. Joseph Jackson Lister's monumental work was published in the philosophical transactions, January 1830. Andrew Ross, who, started to construct objectives about 1832, came up with the idea of an adjustable distance between the front and back elements, and constructed objectives that allowed this distance to be varied. It is uncertain when Ross first made these adjustable fronts. Ross published the first description of a correction collar in the Transactions of the Royal Society of Arts in 1837, but the design shown at the top of this web page is earlier. According to Bernard Hartley, Ross first made these in 1835, but as yet I cannot find an independent reference to this date. The first type of correction collar Ross constructed is shown at the top of this web page, and also to the left, and simply consists of an outer collar holding the front element which slides over the inner barrel housing the other elements. Clamping screws on opposite sides of the barrel were used to fix the optimal distance once determined. This design poses at least four problems. One is that it is easy to disturb the specimen and the alignment of the elements when simply pushing or pulling the outer collar. The second is that the focus to the specimen had to be changed with the change of the front element position which neccessarily moved the front element closer or further away from the object being studied. Third, moving the front element carelessly on a high power objective could cause it to crush the coverslip and specimen, not to mention the front element of the objective. Fourth the adjustment of pushing or pulling by hand was crude. 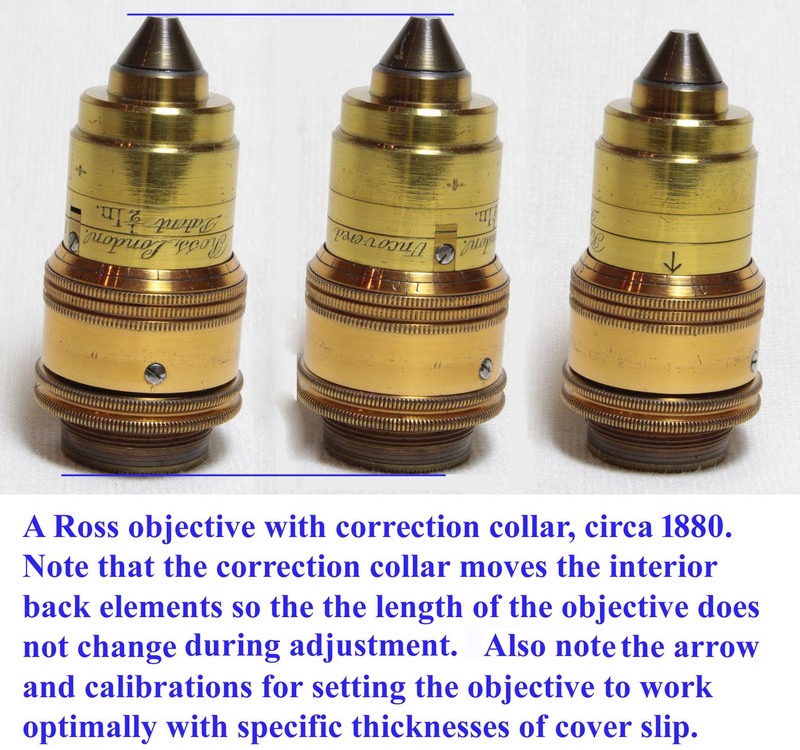 In his 1837 article, Ross introduced the improved form of correction collar. This made the adjustment more precise, utilizing a knurled ring around the objective to control the movement of the outer sleeve holding the front element. 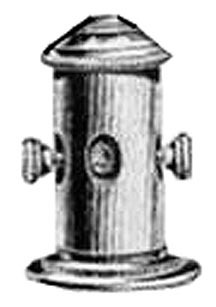 An early example of this improved type of correction collar objective is shown here to the right. 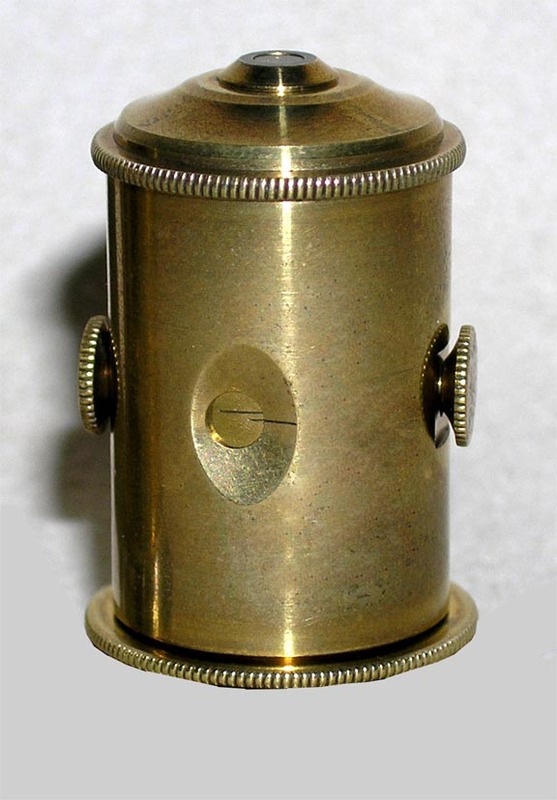 This did not simply provide a thread to screw or unscrew the distal element but utilized a clever design to move the element up or down as the knurled ring was turned. This did not solve the other problems though. A later, and more satisfactory arrangement, said to be first introduced by Francis Wenham about 1855, was to build a system into the interior of the objective that moves the back elements away from, or closer to, the front elements-a much more satisfactory design which was quickly adopted and substantially reduced the risk of crushing the cover glass or specimen. 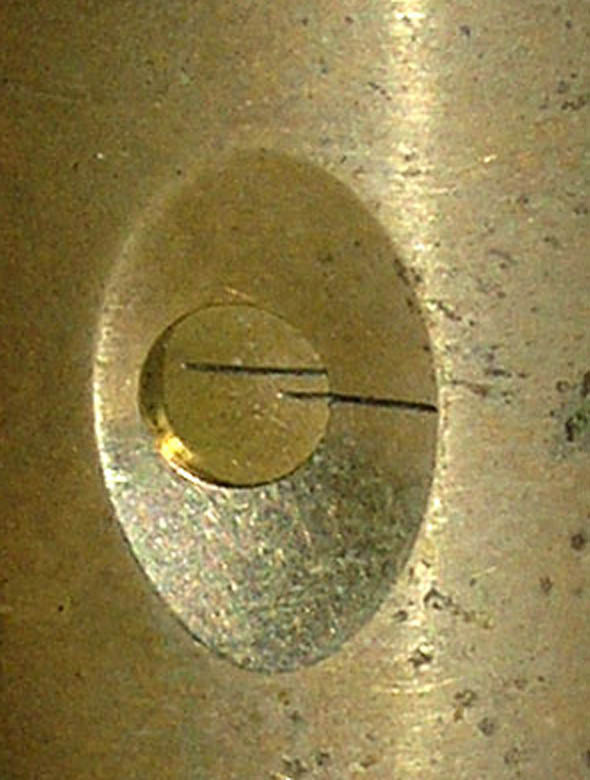 These later correction collars, as shown by the example here, also have calibration marks to set the correction based on a known thickness of coverslip. For this reason, coverslip micrometers came into common use. One could measure the coverslip thickness, and simply adjust the correction collar to match using the calibrated scale. Although cover slip thickness is now 'standardized,' standard cover slips can still vary a little bit, and for very critical work, special high precision-thickness coverslips are available (at considerable additional cost). For ordinary work, just using the standard coverslip thickness that the objective is rated for is usually sufficient. For extremely critical work, objectives with correction collars are still available. Modern microscopes lack a draw tube, so using the draw tube to compensate for cover glass thickness is no longer an option. Other examples of the early form of correction collar shown at the top of this page are rarely encountered. 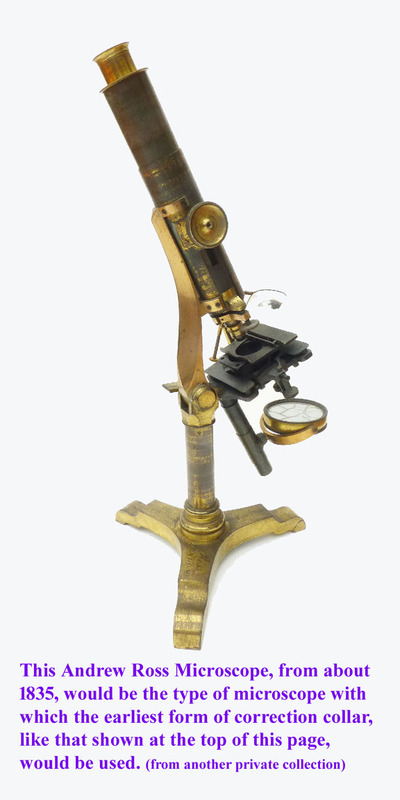 One example is in the collection of the RMS (number 158, page 165), in Turner's Great Age of the Microscope), and another is part of the accessories with a nickel silver model of the 'Penny Cyclopedia' Lister Limb Compound microscope in a private collection, originally sold at Christies South Kensington in 2009. All three have cans signed by Ross, two of which are signed '&frac18; In, AndwRofs & Co Opticians, 33 Regent St, Piccadilly'. This address has been said to date from about 1838, but the exact date of the move is not known. It is conceivable he moved in 1837 or earlier. 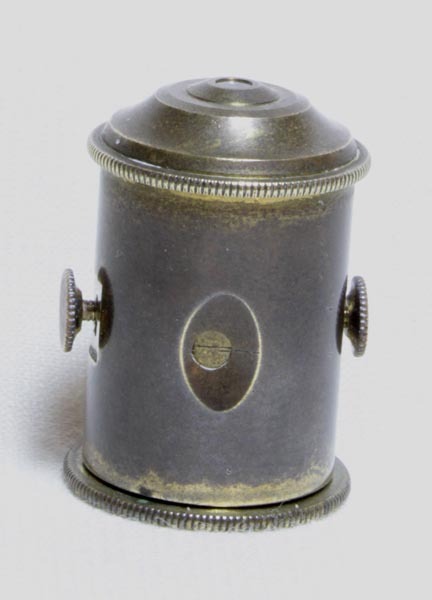 The '& Co' is felt to indicate the association of Lister with Ross, reportedly between 1837 and 1842. Because Ross was already making the more advanced type of correction collar sometime in 1837, I have dated my example above to no later than that year, though left over stock could account for its being supplied with later instruments.